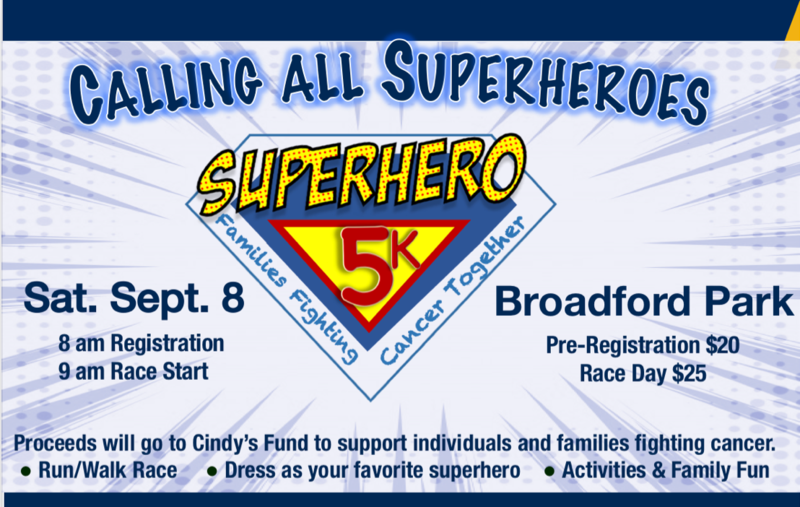 Garrett Regional Medical Center is sponsoring a Superhero 5K that will benefit Cindy’s Fund to support individuals and families fighting cancer. The event will be held on Saturday, September 8 with registration beginning at 8 a.m. and the race starting at 9 a.m. at Broadford Park in Oakland, Md. All ages are encouraged to participate in this 5K run or walk and participants are encouraged to dress as their favorite superhero. Race registration is $20 in advance and $25 on race day. The registration includes a t-shirt and participants are encouraged to register before August 23 to guarantee their shirt size. To download a registration form, click here. Cindy’s Fund is a nonprofit organization that provides assistance for Garrett County citizens who have been diagnosed with cancer. Proceeds from Cindy’s Fund covers miscellaneous expenses not covered by insurance which may include gas cards, hotel stays and medical/nutritional supplies. For more information, visit http://cindysfund.org.